Two San Antonio kids have started a non-profit organization collecting cleats for those who can't afford them. SAN ANTONIO — Mia and Myles Stewart are already ahead of the game. 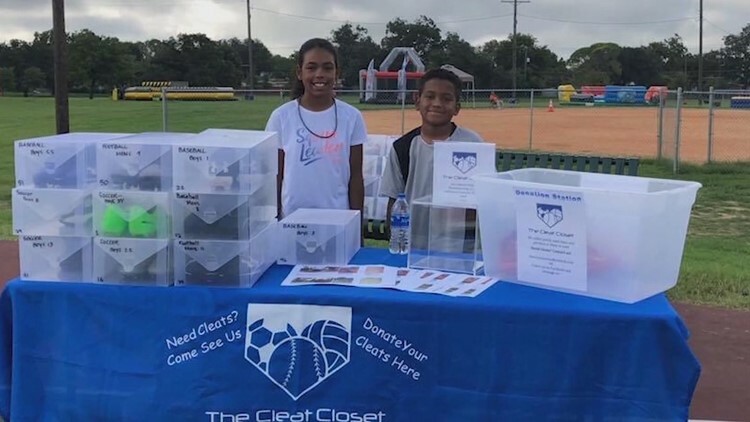 The duo, just 10 and 11 years old, formed ‘The Cleat Closet,’ a non-profit organization that has collected nearly one hundred pairs of gently-used athletic shoes for children around the city that can’t afford to buy them. The organization does not charge anything to anyone that reaches out to them. If they don’t have the shoe or sport in their inventory, they use funds donated by the community to purchase and personally deliver them. They said the idea came about while the family was doing some spring cleaning and noticed they had outgrown many of their baseball cleats. “We started talking about what to do with them. Usually, we would just donate them somewhere and they wanted to do something a little bit differently with them," Michelle Stewart, the kids’ mother said. "Organically, the conversation just grew to what else we could do with the cleats and they came up with the idea of giving them to people that might need them that might not be able to afford them." They currently have football, soccer, baseball and golf cleats, band shoes and a little bit of everything in between. The family said the reactions they have received make all of the hard work absolutely worth it. “They look like they are about to cry, like they just got a brand new car and they always say 'thank you' and they like, hug me and stuff,” Myles said. “It makes me feel great because some kids don’t have the opportunity to play sports like they want to and then when we deliver them cleats. They have the chance and opportunity to be like the next Michael Jordan or something,” Mia added. Mia and Myles parents said the drive their children have for helping other kids has been phenomenal to watch. “What I want people to know about them is that they are both very, very incredible kids. They are both very smart, they do well in school and their hearts are in the right place. It’s been awesome to see them go on this journey. For my husband and I to be right there supporting them and watching the impact that they are making in some kids lives,” Michelle said. The organization is always accepting donations of any size and sport as the need for all kinds of shoes changes with the sport in season. They also accept donations through PayPal to fill the gaps for shoes they do not have in stock. If you or anyone you know is in need of cleats or you’d like to donate, reach out to the Cleat Closet by calling the organization’s phone number at 210-861-4478, email them at thecleatclosetsa@outlook.com or contact them on their social media page.